When you upload a list or link an account, DataValidation’s email list checker pulls your information into our system and analyzes your email lists. You can view these lists from the All Lists section in the navigation bar on the left. Details for each list are located on its Report Card. Information on the front of a Report Card includes the list score, date of import, and number of subscribers. When you flip the card over, you will see the percentage of emails with each Email Assurance grade and a brief description of these grades. To receive the cleaned email list and the complete Address-by-Address analysis from the email list checker, you will need to purchase a One-time Tuneup. You can add the list to your shopping cart from the front of the Report Card. When you have selected the list(s) you wish to purchase, navigate to the checkout screen by clicking the cart icon in the top right navigation bar and following the link to Checkout. Once you reach the checkout page you can checkout using a Credit/Debit Card or choose to purchase prepaid token packs. 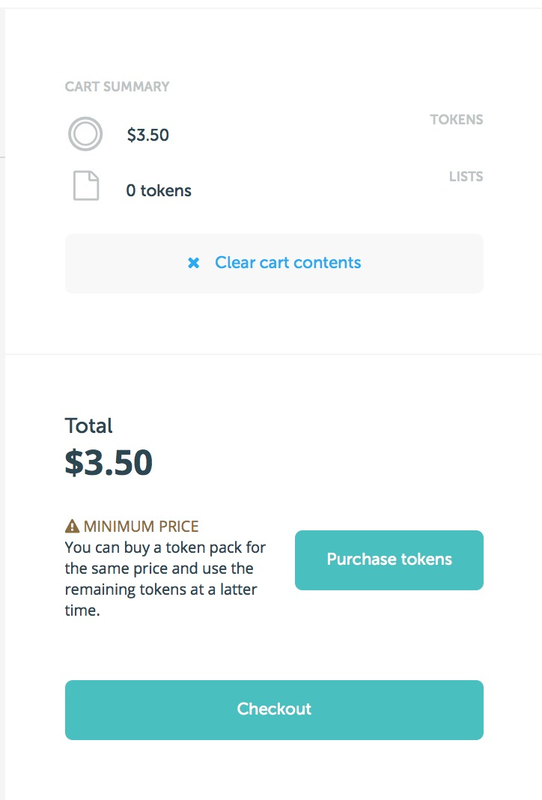 If your list is below our minimum price, you can purchase the smallest token pack - 500 tokens for $3.50. Any leftover tokens will remain in your account for future use. You will be prompted to enter your credit card information. If you have previously supplied your credit card information, you have the option to choose a payment method from stored cards.